excellent WON JUNIOR CLASS and obtained the CAC award at only 11months of age! The judge was Tarmo Viirtelä from Finland. Congratulation too Suvi and Juha. EL Minja`s Aimeè and Suvi. In Spain, On saturday Ruth Revillas from Malaga in Spain went to the Dog Show in Jerez de la Frontera (Cádiz) and EL Minja's Gold Digger obtained best puppy in breed and later that dogshow he became Best Puppy in Group. congratulation Ruth! 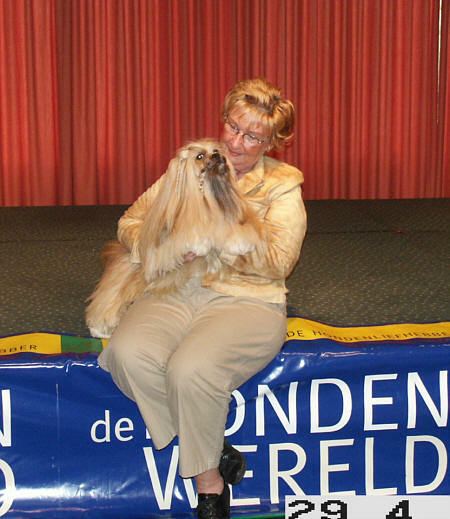 Last weekend we have been showing at the Great International Dogshow at Bleiswijk Netherlands. 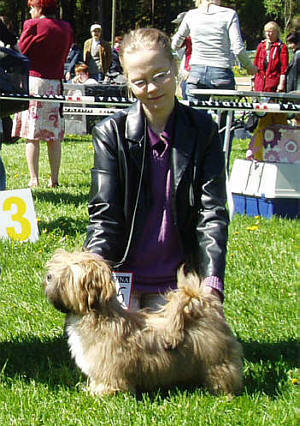 My Lhasa Apso male Kokomo Kalif "kalif" obtain 1ex with the championship CAC/CACIB and Best of breed shown by our handler Marianne ,Gerda 's Lhasa Apso female Nirvana dar Tibetu obtained as well 1ex with the championship CACIB, Sylvia presented EL Minja's Thamina and obtained 2nd ex. Kalif was awarded Best in Group 4. The judge for the breed and group was breed specialist Mr Paul Stanton. Congratulations Sylvia, Marian en Gerda. 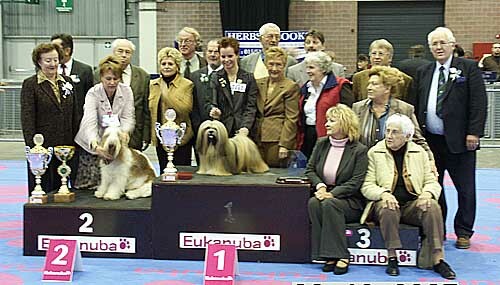 Best in Show at the CAC-CACIB int.Dogshow Leuven! Lovanium international dogshow with CAC/CACIB 22/23 october, my Lhasa Apso male Kokomo Kalif won 1ste Ex and obtain the championships CAC/CACIB and Best of Breed , my Lhasa Apso female EL Minja's Thamina won as well the 1ste Ex and obtain the championship CAC/CACIB. in juniorclass Na-Ri obtain also 1ste Ex and best junior. 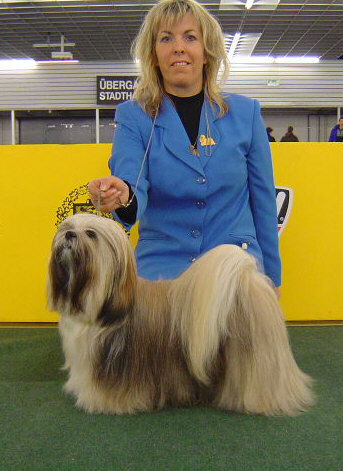 The Lhasa Apso breed was judge by Mrs.Gillian McDowell and Kalif was running trough the ring of honor in the Group 9 judging under judge Mrs Monique Van Brempt, Best of Day honored by judge Mr Jacques Senecat, on Sunday the Best in Show judging was done by promiment judge Mr Martin van de Weijer. 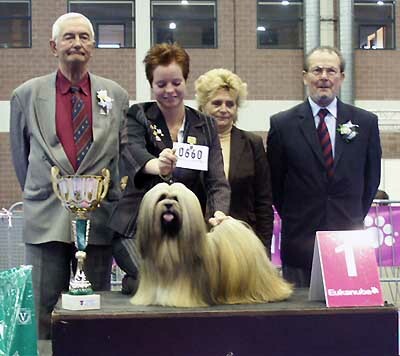 Charleroi International Dogshow in Belgium, my Lhasa Apso male Kokomo Kalif "kalif" won 1ste Ex and the championships CAC/CACIB and Best of Breed handled by Marian Stiphout ,Gerda and Frank's Lhasa Apso female Nirvana dar Tibetu handled by Gerda won 1ste Ex and the championships CAC/CACIB the judge was Mr Ferrari from Italy. Congratulations too Marian and Gerda and Sylvia. Great news from the USA our homebred Lhasa Apso Champion EL Minja's Walk on Water will be printed at the prestigious AKC Gazet magazine cover for october issue, this magazine from the American kennelclub, it's a great honor for us. Walkers children on the inside cover and pages as well as the Lhasa Apso article. Thanks to Fran Strayer! At the great MECC Maastricht Int. 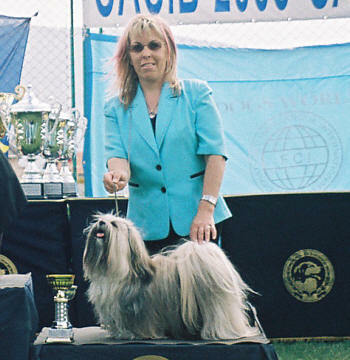 Dogshow our Lhasa Apso male Kokomo Kalif "kalif" obtained 1ste Ex and obtain R.CAC/R.CACIB ,our Lhasa Apso female EL Minja's Thamina obtained 1ste Ex in openclass and the championships CAC/CACIB best female and Best of Breed with handler Marian Stiphout under judge Mr Hans Boelaars. Thamina obtained a 3rd Group placement under judge Mr Hans Hilverda, a great performance for such young dogs. Nirvana dar Tibetu with Gerda obtained 3rd excellent Proficiat too Marian and Gerda. Ch. NuSeng Walkin in Sunshine [CH El Minja's Walk on Water X Ch EL Minja's Wind in the Willow] completed his American Championship at the Lhasa Apso Club of Central Colorado's Regional Specialty on Friday 9/9/05 by going WD, BOW & BOS and was Best Bred By in Specialty under Breeder Judge Darby McSorley. Also Arielle went Best Puppy in Sweepstakes from the 6 - 9 puppy class and was the overall Best in Sweepstakes Winner under AKC Judge Monica Canestrini. That brings CH El Minja's Walk on Water total of sired Champions to 8 there are till today 10 American Champion with the EL Minja's prefix, "Walker"is the litter brother of BIS,BISS,Multi Champion EL Minja's Thsang-Pa. 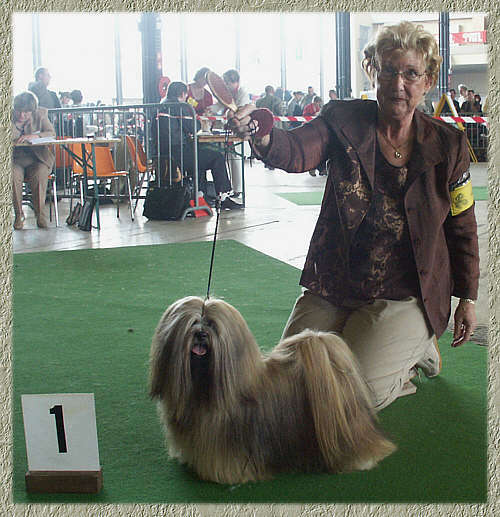 The International Dog show Oostende, Belgium, our Lhasa Apso male Kokomo Kalif "kalif" obtained 1ste Ex in openclass and obtain CAC/CACIB ,best male and Best of Breed under judge Mr E.Deutcher, perfectly shown by Miss Marianne Stiphout. 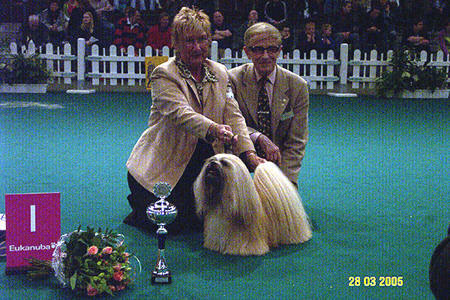 "kalif" obtained with The champion handler Marian Stiphout the awarding for 3rd Best in Show handling for junior and senior competitors. 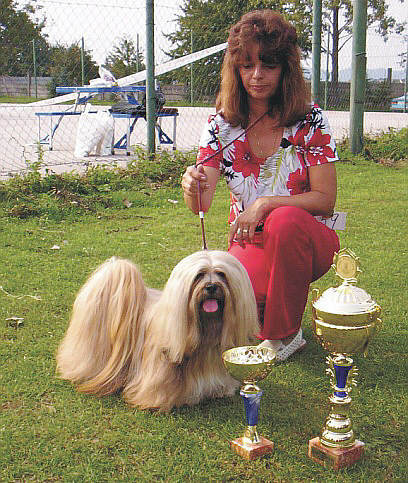 Champion EL Minja's May Boy obtain Best In Show at the Ruzindol dogshow in Slovakia under judge Mrs Bernardis from Austria. Congratulations too Eliska Vaskova for this Great performance and many thanks for showing him. 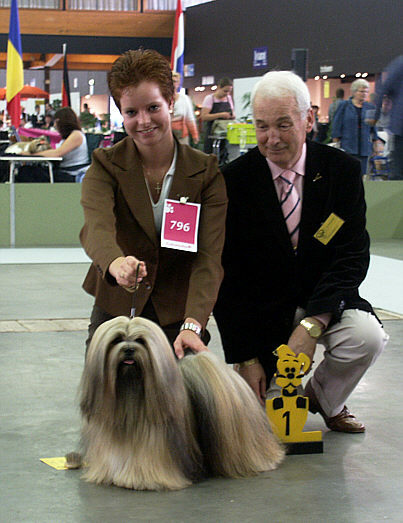 At the Mechelen Int.Dogshow our Lhasa Apso male Kokomo Kalif "kalif" obtained with The champion handler Marian Stiphout the awarding for Best in Show handling for junior and senior competitors again. Nirvana dar Tibetu with Gerda obtain res.CAC/res.CACIB under judge Mrs Toebak Proficiat too Marian and Gerda. Marian and Kalif in action! 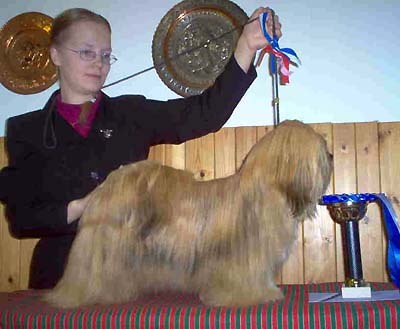 At the Lapland,Tornio Dogshow , EL Minja's Aimeè obtain BOB-puppy!The Judge was Mrs.Kirsti Lummelampi,Finland. EL Minja`s Aimeè age is at this show 7 month`s old. Proficiat Suvi and Juha Ranta from Finland. 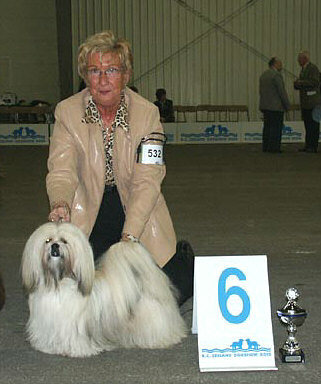 In Hungary CH EL Minja's Sweet Sensation obtained her first CAC for Hungarian champion under judge Sylvie Desserne. 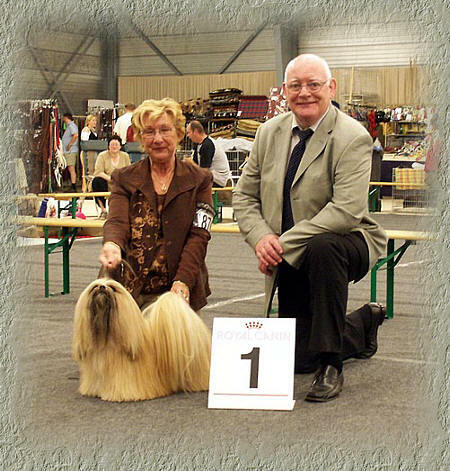 Internat.dog show La Louviere,Belgium,our Lhasa Apso male Kokomo Kalif "kalif" obtained 1ste Ex in openclass and obtain CAC ,best male and Best of Breed. 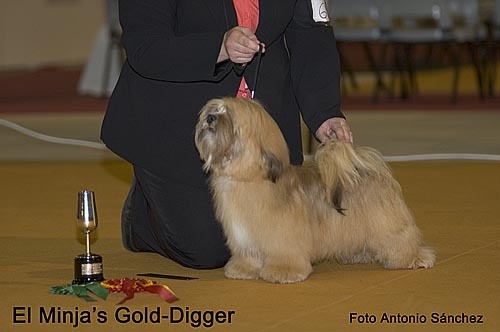 Lhasa Apso female EL Minja's Thamina obtained 1ste Ex in openclass and the championship CAC best female with Lia under the judge Mrs Dianne Millecam-DeGrijze. 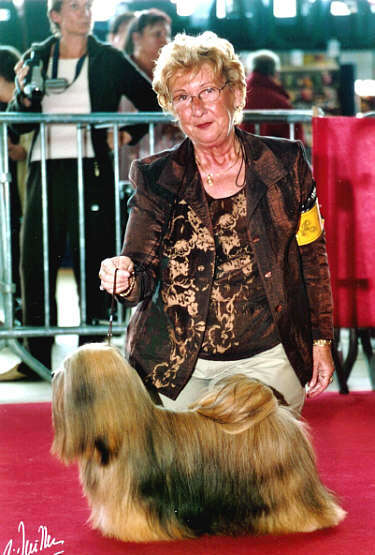 The champion handler Marian Stiphout with our EL Minja's Thamina obtained Best in Show handling junior and senior competitors, Marian was awarded 2 years ago best junior handler at the famous Crufts dogshow in Birmingham. 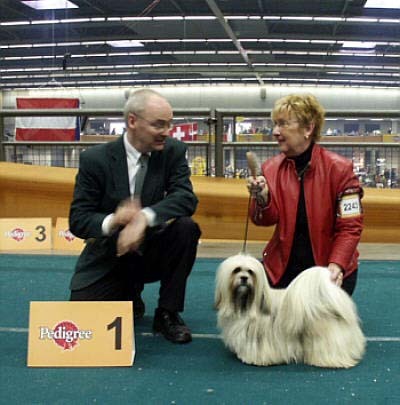 Our Lhasa Apso male Kokomo Kalif obtain in the group judging Res.Best in Group under FCI Group 9 specialist Mrs Dianne Millecam-DeGrijze from Belgium. A great experience for this young dog "Kalif". Congratulations to Marian, Lia and Sylvia, thank you judges. 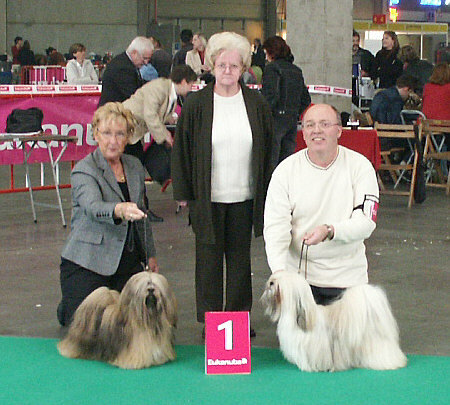 At the Internat.dog show in Brno ,CZ - CH Le Sajnim Indian Dream obtain CAC , under judge Mrs.Bregenzer from Austria. At International SCG on 3 day's dogshow Sarajevo CH EL Minja's Sweet Sensation obtain CAC and at Sarajevo dogshow CH EL Minja's Sweet Sensation obtain 2 days CAC/CACIB and 3rd day CAC and BOB. EL Minja's Limited Edition [Tanja] with Mrs Nadya Razorenova from Cyprus and Sylvia leaving our house for living in Cyprus, Tanja is a daughter of CH EL Minja's Thsang-Pa X CH EL Minja's Dream On, we wish Nadya and Kristina all the best with her beautifull girl Tanja. 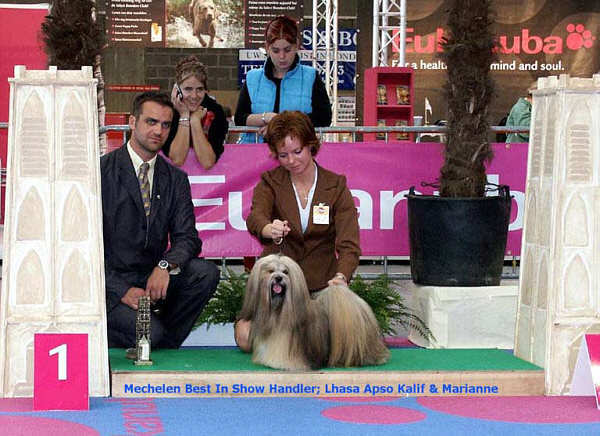 European Dogshow in Austria, CH EL Minja's Sweet Sensation obtain R.CAC and at the Tibetan Euro dogshow Sweety obtain the CAC. Sweety is proudly owned by Mojca Bregar,Slovenia. Thank you Mojca and Congratulation with this result. It was a very Hot Int.Dogshow at Berghem-Oss, but our homebred BIS,BISS,Multi Champion EL Minja's Thsang-Pa won CAC/CACIB and best male and Best of Breed and Thsang-Pa his daughter our homebred Lhasa Apso female EL Minja's Thamina obtained her 3rd place.judge by Mr S.Oats, Champion EL Minja's Thsang-Pa obtain in the group judging he finished Res.Best in Group under FCI Group 9 specialist Mr.P.Prins from Holland. A great and hottest day with excellent performance. In Tampere allbreed puppyshow,Finland, EL Minja's Aimee won Best female puppy, just 6 months of age and very well performing under judge Juha Putkonen, congratulations for Juha and Suvi Ranta,thank you for this wonderfull news. 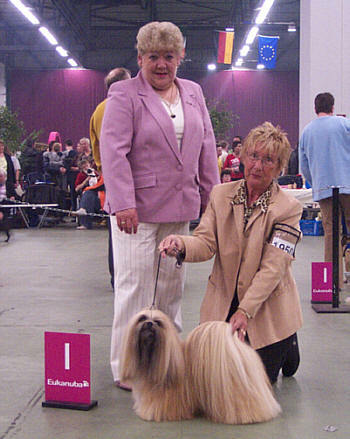 At the Namur,Belgium Throphee de Wallonie Int.Dogshow, our Lhasa Apso male Kokomo Kalif "kalif" obtained 1ste Ex in openclass and obtain CAC/CACIB and Best of Breed. 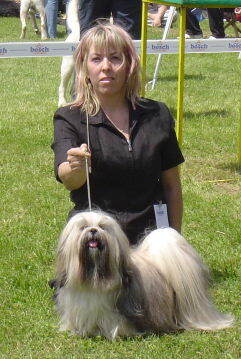 Lhasa Apso female EL Minja's Thamina obtained 1ste Ex in openclass and the championship CAC/CACIB under the judge Mr Hans Boelaars. 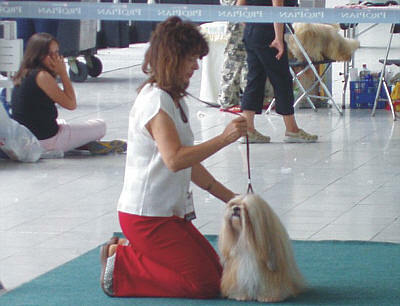 at Verazdin,int.Dogshow CH. 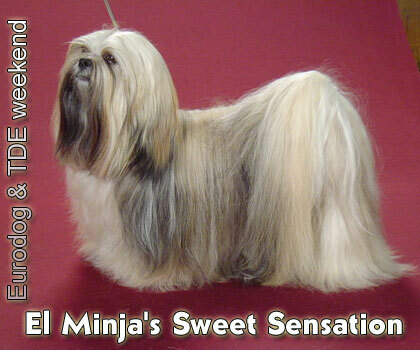 EL Minja's Sweet Sensation obtain the CAC/CACIB ,and Best of Breed. and group 2, judged by Mr Erwin Deutcher, congratulations for Mojca Bregar and Sweety thanks for showing her! BIH CH SLO, CRO, Aust J CH EL Minja's Sweet Sensation and Mojca. At Utah valley kennelclub, Sunny [Ch EL Minja's Walk on Water x EL Minja's Funny Face] obtain a 4pt major under mr Ed Bivin, at Sarajevo and Mostar int. CH EL Minja's Sweet Sensation obtain 2 times CAC/CACIB , BOB and group 3 and her BIH Championship title. At Arnhem Int, Kokomo Kalif obtain the res.CAC/CACIB. EL Minja's Thamina and her daddy CH EL Minja's Thsang-Pa obtain the 1st and 2nd in the classes. CH EL Minja's Thsang-Pa x Bi-Tchu v.S.D. At the Slezska dogshow in Hlucin -CZ- CH Le sajnim Indian Dream obtain CAC and Best male, under judge Mr.Matyas from Slowaky. 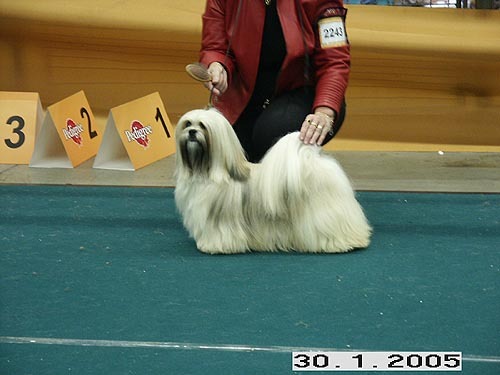 With this winning Champion Le Sajnim Indian Dream obtained his 3rd champion title "Czech Lhasa apso Club Champion", CH EL Minja's Honeyby obtain her title of Best Veteran in Show at this show. Thank you Eliska. 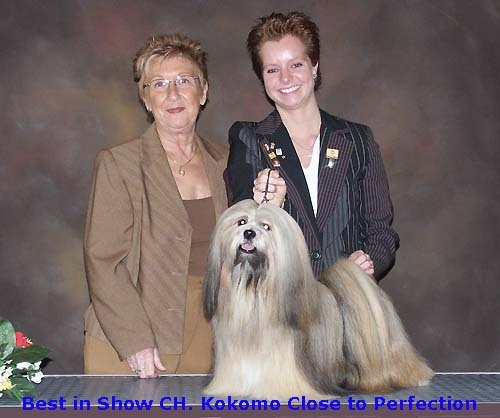 At the Int.Dogshow BRABO WINNERSHOW in Antwerp,Belgium, our Lhasa Apso male Kokomo Kalif "kalif" obtained 1ste Ex in openclass and obtain CAC/CACIB and best male. 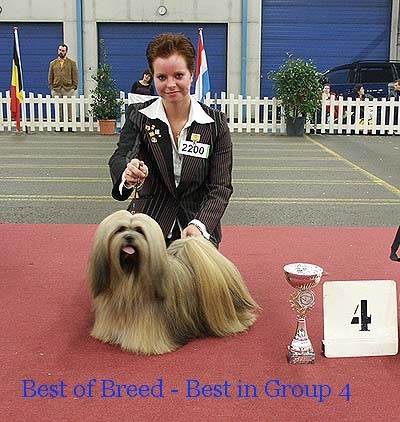 Lhasa Apso female EL Minja's Thamina obtained 1ste Ex in openclass and the championship CAC/CACIB and best female with Best of Breed at her age of 17 months, her kennelmate Lhasa Apso female Nirvana Dar Tibetu handeld by Gerda de Vries obtained 2ste Ex in openclass and the Res.CAC/CACIB judge was Mrs Maria de Wilde-Voet. 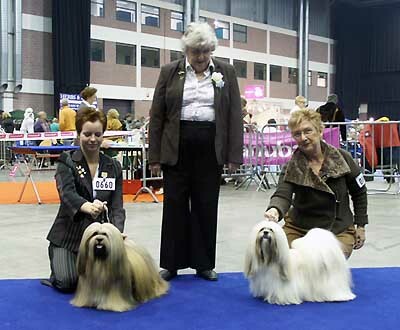 The international dogshow in Goes the Netherlands, Our homebred BIS,BISS,Multi Champion EL Minja's Thsang-Pa won CAC/CACIB and best male and Thsang-Pa his daughter our homebred Lhasa Apso female EL Minja's Thamina obtained her 3rd CAC championship with CACIB and best female and Best of Breed at her age of 16 months in the group she obtain 6th place. The judge was the wellknown Mrs Lilian De Ridder-Onghena from Belgium. Third time shown in the ring in the Netherlands!!! At the Hong Kong kennelclubshow in China Lhasa Apso BIS.multi Champion EL Minja's Nag-po-Chen-Po won best of breed and groep 4 placement, thank you Andrew and Rex team. In Austria J.CH.EL Minja's Sweet Sensation obtained the CAC/Res.CACIB championship, judge was Mrs I.Ehold from Austria, congratulation too Mojca! 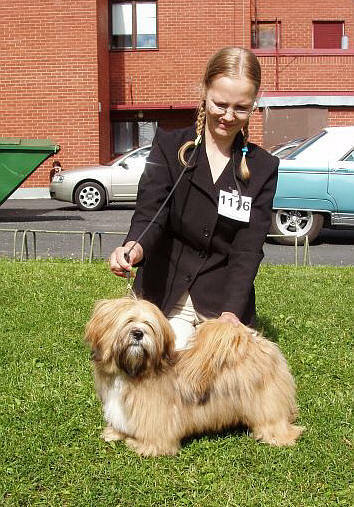 At the int.dogshow in Luxembourg our Lhasa Apso male Kokomo Kalif "kalif" obtained 2nd Ex in his class. 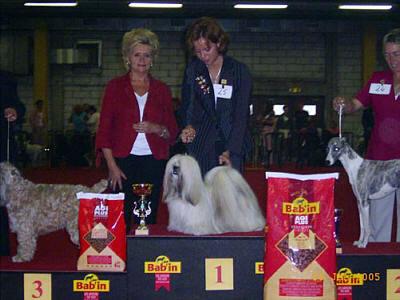 At the Leeuwarden Eastern dogshow Kalif obtained again 1ste excellent. Our homebred BIS,BISS,Multi Champion EL Minja's Thsang-Pa won CAC /CACIB with best male and Best of Breed under judge Mrs A Bryne from IRL , Thsang-Pa had the honor to win again BEST IN GROUP group judge was Mr J Weinberg from Germany and Best In Show 6 under judge Mr M van den Weijer! over 2100 dogs. "Champion of Poland".The Judge was Mr. Matyas from Slovakia,many thanks to Eliska Vaskova for showing and taking very well care of "Bing"! 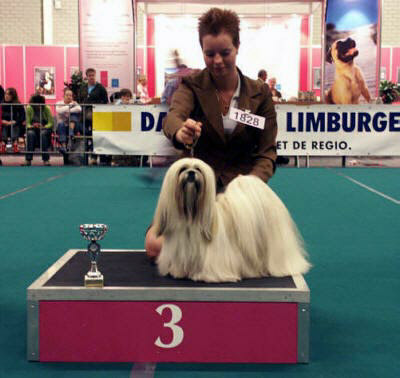 At the Int.Dogshow in Wieze,Belgium, our Lhasa Apso male Kokomo Kalif "kalif" obtained 1ste Ex in his class and obtain CAC and best male and Best of Breed! 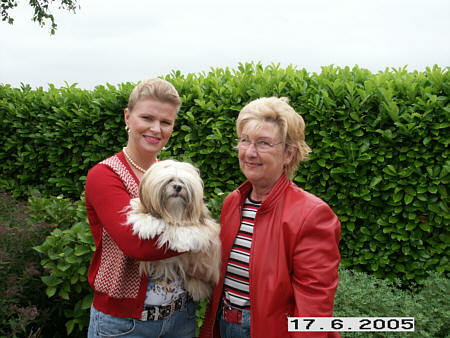 Lhasa Apso female Nirvana Dar Tibetu handeld by Gerda de Vries obtained 1ste Ex in his class and obtain CAC and best female, kennelmate Lhasa Apso female LE Sajnim Missy Cheekabee as well obtained 2ste Ex in her class and obtain Res.CAC judge was Mrs Maria de Wilde-Voet. 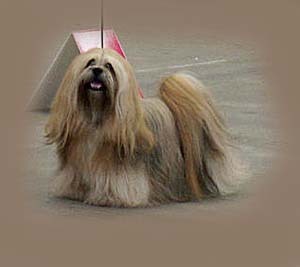 At the Int.Dogshow in Zuidlaren,Nederland, Lhasa Apso male Kokomo Kalif "kalif" obtained 1ste Ex in his class and obtain Res.CAC/CACIB his kennelmate Lhasa Apso female LE Sajnim Missy Cheekabee as well obtained 1ste Ex in her class and obtain Res.CAC/CACIB , the judge was Mr R Golzem from Germany. 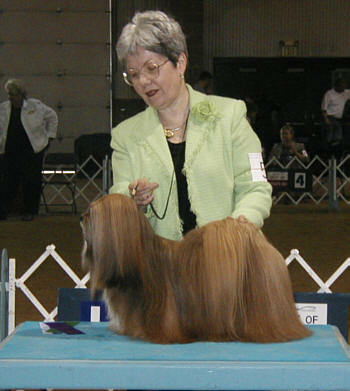 In Austria J.CH EL Minja's Sweet Sensation obtain CAC/Res.CACIB under judge Mrs U.Eisner. 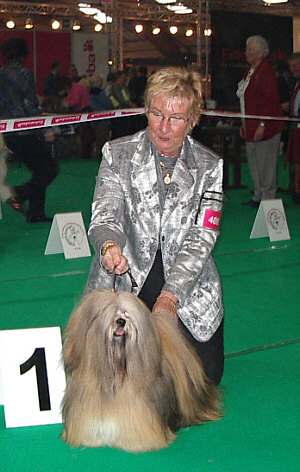 At the Int.Dogshow in München,Germany, JCH.EL Minja's Adasha obtain her first Int. CACIB at the young age of 18 Months under judge Mr Erwin Deutcher.EL Minja's Adasha won 1ex.CACIB,CAC,VDH,best female and the title of "Landessieger Bayern". Congratulations too Mrs Karin Hertz. 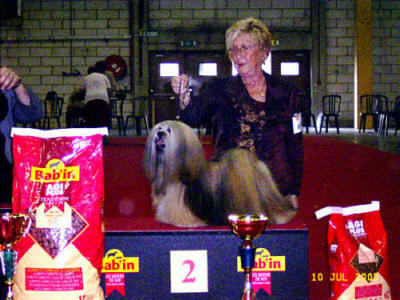 Eindhoven Int.Dogshow & New Champion!! 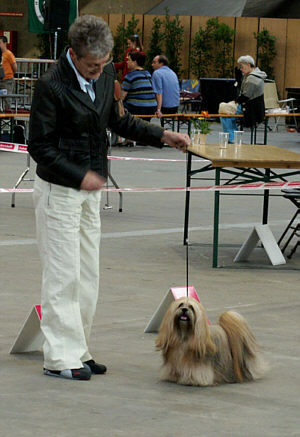 ***Eindhoven Int.Dogshow the first Dogshow this year for us ,our Lhasa Apso male Kokomo Kalif "kalif" obtained 1ste Ex. 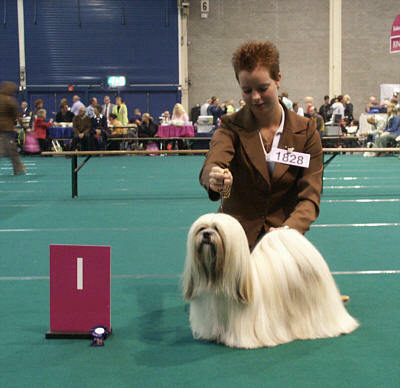 in juniorclass this show at 14 months of age, Our homebred junior Lhasa Apso female EL Minja's Thamina daughter of my BIS,BISS,Multi Champion EL Minja's Thsang-Pa we can proudly announce you that "Thamina" obtained her first CAC championship and BEST Female at this show at 13 months of age, first time shown in the ring!!! Judge was breedspecialist mr.K Scheel from Denmark. ***New Champion!! 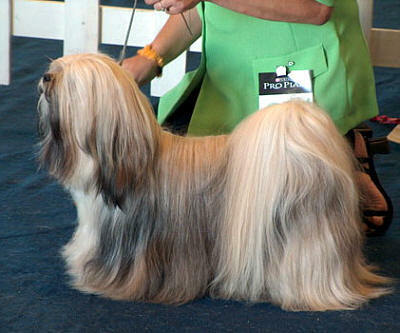 CH.Le Sajnim Indian Dream won at the International dog show in Trencin / Slovakia /. 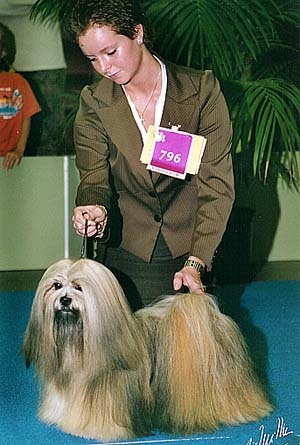 "Bing" obtained his last CAC for his title Champion of Slovak Republic the Judge was ,Mr.Gunis from Slovak Republic. Thank you Eliska for excellent handling Bing.